Whenever I do a Radio Dept post (see yesterday), I’ve gotten in the habit of asking where their countrymen Douglas Heart have gone? It’s been some time since their I Could See The Smallest Things EP and aside from a cover of Slowdive’s “Alison” for the Never Lose That Feeling shoegaze tribute album, there’s been nary a peep from them. Well thanks to the wonder of MySpace I’ve found that not only are they working on a new album (though not for Labrador), but they’ve even made a couple of rough mixes of new songs available to stream. Happy day! 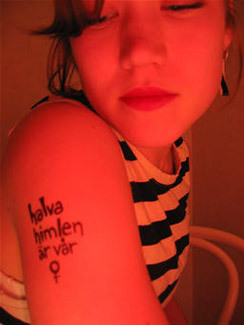 But while searching for Douglas Heart news, I found this post at One Louder which pointed to We Are Soldiers We Have Guns, another project of Douglas Heart singer Malin Dahlberg with the laudable manifesto of “We Are Soldiers We Have Guns will never be cool or cute, and it will never be ironic”. Much simpler sonically than the Douglas Heart material, it’s nonetheless just as beguiling thanks to Dahlberg’s winsome voice. They have one self-titled EP out already and will be releasing a second this Summer. Download below or stream via MySpace. And from the We Are Soldiers links page, I came across Audrey, their labelmates on Stereo Test Kit. They’re another Swedish combo that was brought to my attention a little while back by Everything’s Swirling and whom I’d not gotten around to writing about till now. Having just released their debut full-length Visible Forms on May 9, they produce beautifully slow and stately music that has as much Icelandic flavour as it does Swedish with Bjork-ish vocals over Sigur Ros-ish arrangements. Check out the first single from the album below and also visit their MySpace. Coincidentally (and wholly independently of my post) Swedes Please is also featuring Audrey. And hopping across the sea, we find Georg Holm of Sigur Ros telling The Milwuakee Journal-Sentinel that Icelandic bands can be as boring as anywhere else. And apparently the band are now label-less in the US? A travesty. They are at Massey Hall tonight. Pitchfork brings news of another Bjork box set – this one is called Surrounded and will feature all nine of her albums remastered and done up in DualDisc format with all the videos for each record accompanying the audio side. Look for it June 27. And some bad news and good news from The Concretes. The bad – their van was broken into this past Tuesday after their show at the Bowery in NYC on and a number of guitars and basses stolen. The good – they’ve made an adorable video for “On The Radio” which you can see here. Man – that’s a lot of great Scandanavian music in two posts, and I wasn’t even really looking for any. With such a fertile musical scene, it’s not really surprising that there’s no shortage of websites dedicated solely to the promotion of bands from that part of the world. Swedes Please and Hello Surprise, both focus specifically on Sweden and and Take Your Medicine recently posted an MP3 love letter to Swedish uber-label Labrador. It’s A Trap!, however, covers the whole of Scandanavia and wonderfully so. They’ve just released a compilation of Scandanavian artists called It’s A Trap! Readers Companion Volume 2 and it’s a great mix of styles ranging from the sweetest indie pop to electronica and country twang. You can stream the whole thing off their website and it’s a mere pittance to buy – like the same price as an extra value meal. Man those things are expensive now. Anyway, early listening standouts include Hello Saferide, Paris… Expect to see coverage of more than a few of the artists on this disc in the future in what seems to be becoming a periodic “Hello Scandanavia” feature on this site. And I think I’m going to keep this Scandanavia thing running a little longer. I was there last Fall, y’know. Amazing places. If you’re in a Nordic mood, check out my pics from Stockholm, Helsinki, Oslo and Copenhagen. Beautiful cities, all. Sambassadeur is another great Swedish band at: http://www.sambassadeur.com/. Check out "Between The Lines" on the Media page.